The symbolism of Easter offers an opportunity to reflect on the importance of the natural world and the shift of consciousness required for the survival of life on this planet. If we are to find a way forward we urgently need to address climate change and environmental degradation. 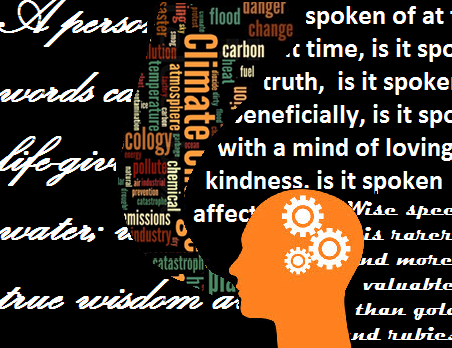 To alter our perilous trajectory we need to assume responsibility for the state of our world. Science alone will not take us where we need to go. We need a transformation that will enable us to address the wide range of human activities that are adversely impacting the Earth's ecosystems. Science alone cannot solve the crisis we face, to do that we will need a spiritual and cultural transformation. Christian Climate Action (CCA) is one of the faith groups that is taking part in the UK's Extinction Rebellion (XR). CCA is an Affinity Group within XR and they are taking part in the International Rebellion that calls for "sustained mass disobedience". CCA is part of a wave of protests that started on April 15th and will continue until at least April 27th. Caroline Harmon is with the CCA group and she said that her group has received messages of support from Christian communities around the world. Many told her that they are "inspired" by the CCA's protest actions. 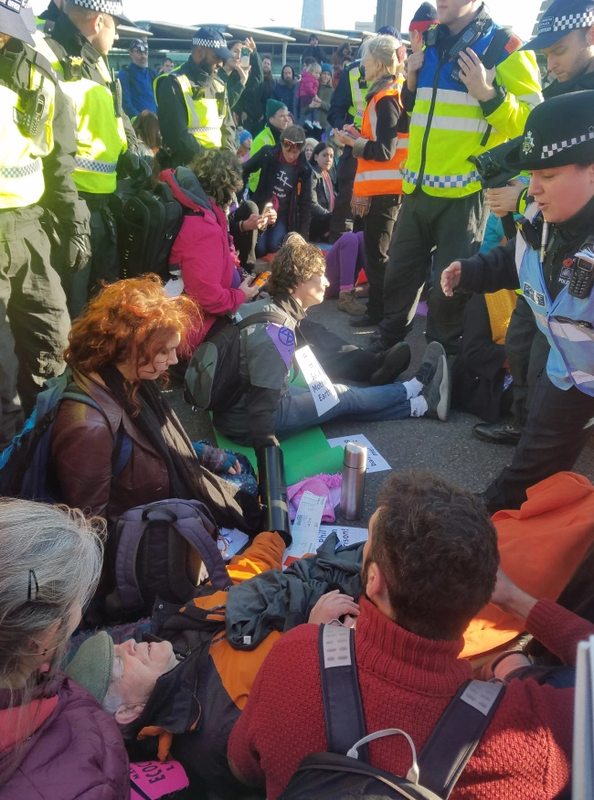 "The Extinction Rebellion has brought a lot of new people into the world of activism and tapped into new energy." Harmon said. "We’re really keen to see more Christians get involved." Earth Hour takes place on Saturday March 30th between 8:30 pm and 9:30 pm. Faith communities all around the world are taking part. The theme for year's Earth Hour is nature, specifically speaking up about why nature matters. Christians in the Anglican Diocese of Montreal have done so in a poll that overwhelmingly demonstrates their support for nature. The poll also brings up some important issues regarding action and suggests some approaches that may prove helpful. To see the results of the poll click here. 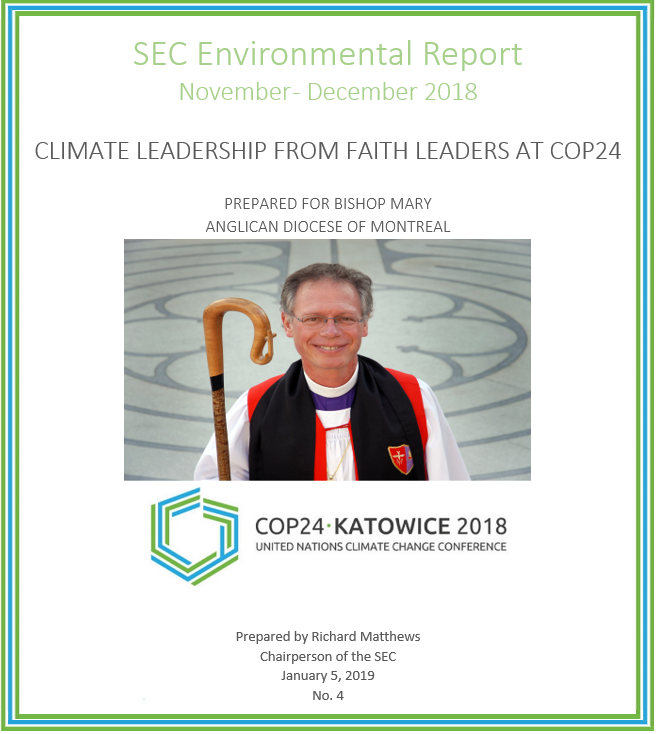 The SEC's fourth quarterly report for Bishop Mary was prepared by the Stewardship of the Environment Committee (SEC) in January 2018. 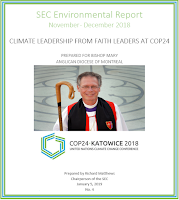 In addition to reviewing the SEC's fourth quarter efforts, this edition focuses on COP24 and faith leaders climate advocacy. It also explores why faith leaders are good climate leaders. 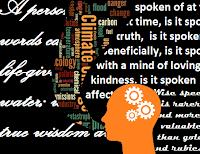 As always we welcome your comments and questions. This is the third installment in an eight part series that offers information and tips related to climate action and protecting our environment. The SEC's Eightfold Path of Environmental Action is a companion series to a video that is scheduled to be launched in 2019. The Jesus Movement: Good News For All Creation from ecoAmerica on Vimeo. We take a leadership role in our communities. As part of the Anglican Communion, we encourage Anglicans to support sustainable environmental practices as individuals in their daily lives and throughout their communities. Click here for more information about our work. The Stewardship of the Environment Committee is responsible to the Anglican Diocese of Montreal for increasing awareness of our inter-dependence with God's environment and through advice, consultation and support, to foster the improvement of our relationship with the environment. To act as a resource group to the parishes of the Diocese in promoting actions within the parish that reduces their impact on the physical environment. Mr. Richard Matthews, is a former warden at St. Philip's Church. He is the chair and social media coordinator for the Stewardship of the Environment Committee. He spearheaded the fossil fuel divestment motion in the Anglican Diocese of Montreal. He also developed and co-facilitated a course called Ecology and Spirituality. Richard is the owner of The Green Market Oracle and the President of Small Business Consulting (SBC). He is a widely published writer and his articles have appeared in dozens of publications including Scientific American. He has contributed to a United Nations Development Program (UNDP) report on the Green Economy in Action. He lives with his wife and two children in Montreal. Dr. Brooke Struck is a member of St. Philip's Church where he sings in the choir. His doctoral research in philosophy, undertaken at the University of Guelph, focused on the notion of objectivity in science, and how science is related to other forms of cultural practice. He presently works as a science policy analyst at Science-Metrix, a research-program evaluation firm in Montreal. He has previously worked in science policy analysis for Environment Canada, and also co-founded the Philopolis festival series, which provides a space for discussing the intersection between ideas in academic philosophy and present-day issues of society, culture and politics. Mr. Jeffrey Mackie is the verger and an active member of Christ Church Cathedral. He is an internationally published writer and also hosts a literary program at CKUT. He is also very active politically and currently sits on the Verdun executive of Projet Montreal. In 2012 he ran provincially for the Green Party of Quebec.